Denali National Park’s long studied and once popularly viewed East Fork wolf pack is likely no longer. Several members of the park entrance area wolf group have been killed on state land, and the famed pack’s status is unknown. Denali’s East Fork wolf pack declined to just one known female and 2 pups earlier this summer. That after the pack’s last other member, a radio collared male, was spotted dead at a hunting camp on state land off the Stampede Trail in May. Park Service wildlife biologist Bridget Borg says it’s impossible to know for sure if the mother wolf and her pups survived after her mate’s death, but there’s been no recent sign of the animals, and their den appears empty. The apparent demise of the East Fork pack comes amidst a broader steep decline of Park based wolves to around 50 animals. The low point is attributed to more than human harvest outside the park, but it appears to be a significant mortality factor for entrance area wolves. Borg points to the human caused deaths of 3 of 4 East Fork Pack radio collared animals in the last year. Sean McGuire is with the small Fairbanks based advocacy group Alaskans for Wildlife. McGuire said the loss of Denali’s East Fork Pack takes with it valuable opportunity for Park entrance area wolf viewing, as well as a lot of history. The Park’s Borg agreed it’s unfortunate to lose track of the long tenured and well followed East Fork group. State wildlife officials point to robust wolf populations outside Denali. 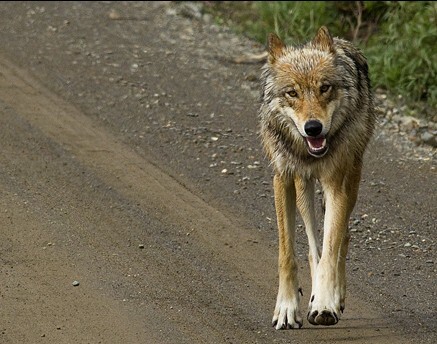 Alaska Department of Fish and Game Regional Supervisor Darren Brunning said the agency has no confirmation of the May East Fork wolf kill, as its radio collar has not been turned in. Brunning said with no other conclusive information about the pack’s status, there’s no reason for action. The Game Board agreed earlier this year to shorten the spring wolf hunt along Denali’s northeast edge, and will consider proposals to re-instate a former no wolf kill area there at a spring 2017 meeting. McGuire said he has no faith in the board and wants the Governor to step in and close the Stamped area to wolf harvest.